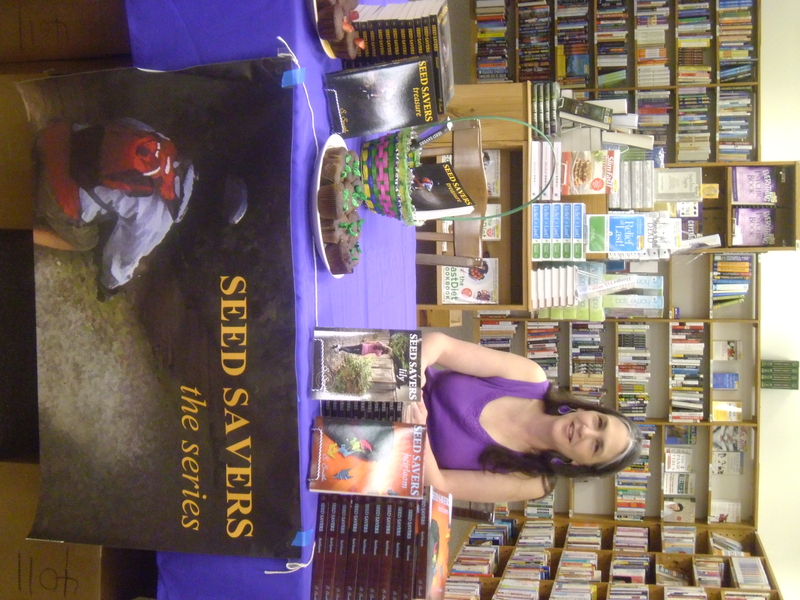 Many moons ago, it seems like forever now, S. Smith sent me a copy of Seed Savers, the first of her young adult series set in an America where growing your own food has become illegal. Children were being taught about seeds and produce gardens in whispers; collecting, saving, and planting seeds a prison-worthy offense. The story couldn’t have come at a better time for me. It was the summer of 2012, I had a small daughter at home, my husband was out of work, and I had just started spending more time and care actively growing more of our groceries. On top of that, I was beginning to learn how to forage and was focusing my daughter’s future education on as much regarding sustainability and self-sufficiency as possible. I wanted taking care of ourselves to come as naturally as literature does for me. I wanted finding edible grapes in the forest to be as simple as knowing that 2+2 = 4. Then Seed Savers happened and it felt like the stars had begun to align. 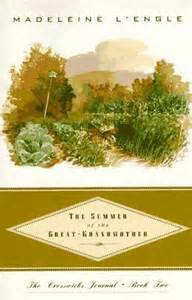 Several books later (Seed Savers, Heirloom, and Lily), we finally have the fourth installment of S. Smith’s world. The girls, Lily and Clare, have done a lot of growing up. Siblings Dante and Clare have received a lot more education during their stay in Canada. Rose is being indoctrinated… bad guys are getting closer and closer to turning everything upside down as rebels have begun starting riots in the street. Soon, all four kids find themselves in Portland, Oregon, where Seed Savers headquarters has been stationed under a forested park in the city for years. More and more, the series is resembling the fast paced action political drama of the Divergent series – without the killing, and with the added fun of things like Dandelion syrup being discussed. 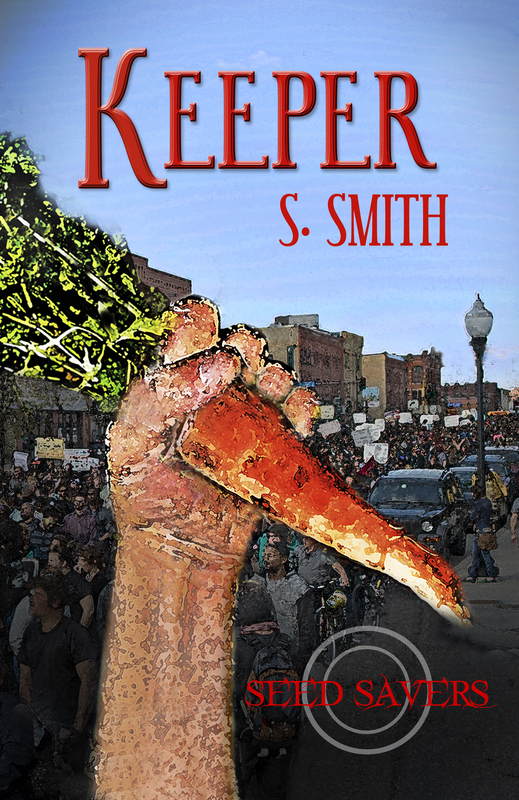 Although I was sent an advanced reader’s copy of Keeper, I still made a point to pre-order a final copy for my kindle. The book is a keeper in every format, and it’s just worth it to be as supportive as possible of this story, help it get told. I’m looking forward to the day Smith gets a movie or mini-series deal. Better yet, the homeschool mom in me votes for it to be a Netflix original. 1. 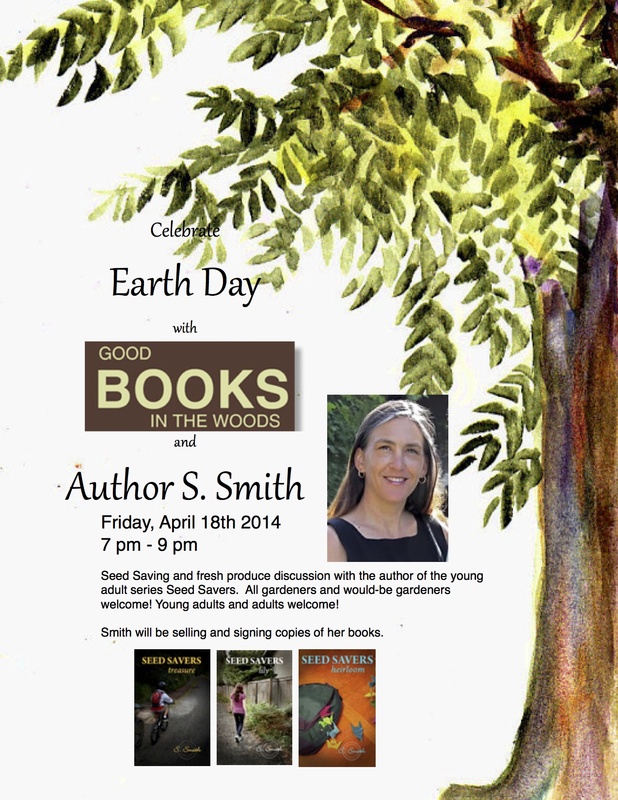 You came to Texas for the first time for an Earth Day celebration book signing tour. Let’s recap, what stores and schools did you visit? 2. Did you meet any memorable customers you’d like to send a shout out to? 3. Where did you visit when you weren’t at bookstores and schools? Unfortunately, my husband and I did not get to do too much touristy stuff, but we got in a little. 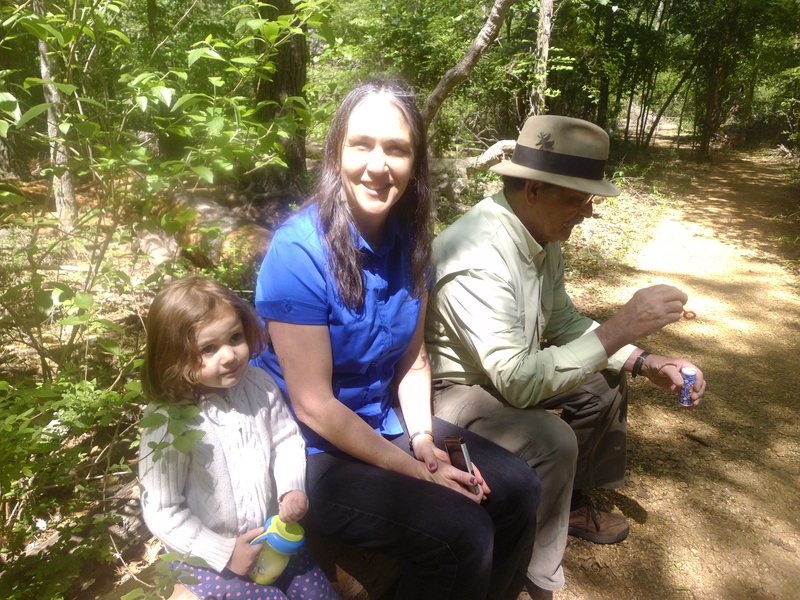 Of course, first, I got to meet my number one fan in Texas and her family, and visit her woods—you! We also got to visit Old Spring. In San Antonio we ran into a spring festival called Fiesta that we hadn’t a clue was happening! We also were staying in an old part of town with historic homes, many included on the “walking tour.” We met the owner of one of those homes (shout out to Victoria! ), who gave us an inside tour of the home. I also got to have dinner with an old friend of mine that I hadn’t seen in 30 years! And of course we did the Riverwalk and had dinner there the first night. Unfortunately, in Austin and Dallas it was just busy, busy, busy. On the way home we got in a quick visit to Petroglyph National Monument in New Mexico and the Grand Canyon. We were sort of on a deadline to get back. 4. Do you have a favorite city or region, now that you’ve been here? I think we both enjoyed San Antonio the most. But it might have been because we were staying at a very good location. Close to downtown and in a cool, older neighborhood. 5. Did you learn anything new on your tour? Sure. I learned how cool Half Price Books bookstores are, for one. Besides books, records, etc., they have lots of very nice stationery products which I am a sucker for. I also learned what the sky looks like when it’s full of dust. I got to see a lot of new terrain. We drove through Idaho, Wyoming, Colorado, Texas, New Mexico, Arizona, Nevada, California, and a touch of Utah. Some of those were for the first time. And the Hoover dam is huge. 6. Did you try any new foods? No, I don’t think so. Unless you count McDonald’s Bacon Clubhouse Burger. Although there were a different kind of beans being served with the Mexican meals than we usually have here. Charro beans? 8. Your trip ran into the Easter weekend. How did celebrating Easter on the road differ than how you celebrate it at home? Normally at home we would go to church in the morning and in the afternoon my family would get together, have a traditional meal where I would bring my homemade egg noodles, my sister-in-law would bring her fried rice, and five or six layer jello, my sister would bring her green or pink creamy salads, mom a pie or two, and whoever is hosting filling in with the rest (ham, mashed potatoes, gravy, vegetable, more pies…). Then the kids would do an Easter egg hunt until nobody wanted to hunt anymore and everyone wanted to hide the eggs. Sometimes we use plastic eggs, but I like to use the real boiled and colored ones. It would be a lot like the scene in Heirloom where it is Easter. This year we drove from Houston to San Antonio on Easter. We managed to get to a church service late and then we were offered some food that they had eaten in the morning before the service. Since we were on the road we ate some. So I had two tamales and an orange for Easter noon dinner this year. But I guess the Riverwalk dinner at night was also on Easter. It just didn’t seem like Easter, but periodically someone would wish us a happy Easter. 9. 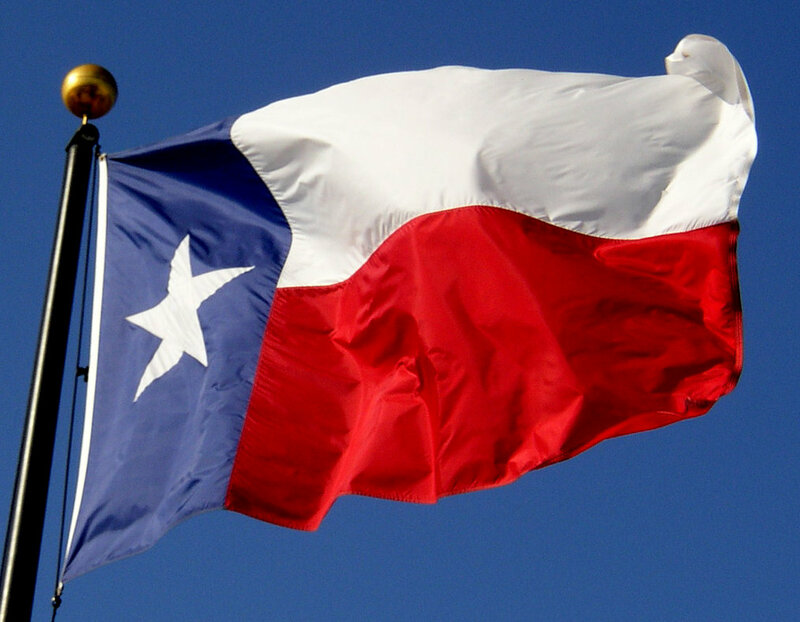 What would you tell non-Texans to expect from a visit to Texas? It’s hot, there are a lot of big roads around the major cities, lots of Texas flags flying, Houston people drive too fast, but folks are friendly. 10. In the third installment of the series, the story takes readers to Florida. Do you see a Florida trip in your future? 4-20, Easter Sunday, Resurrection Sunday, Spring Equinox, Earth Day (on the 22nd)… so many things to celebrate. Today, we hid from them all and took to the woods after doing some spring cleaning and moving of furniture. 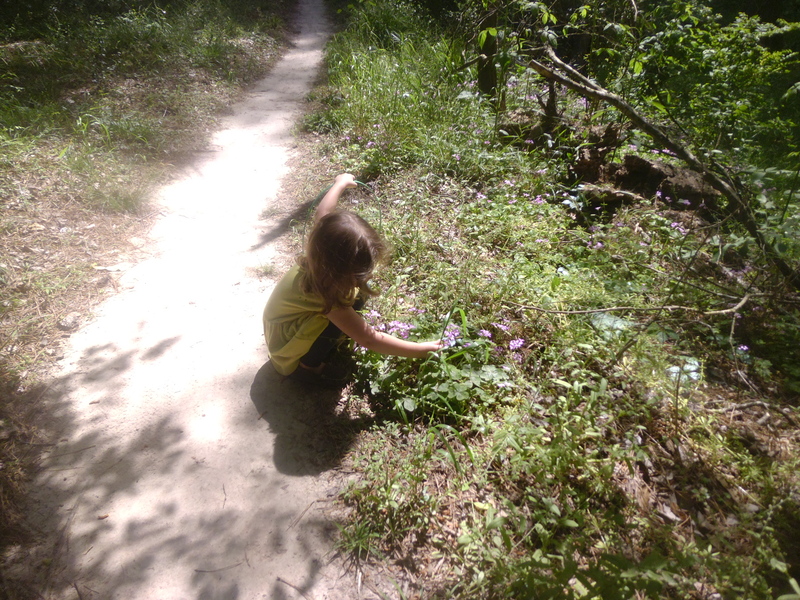 So as we practiced the catechism (“Who made you?” “God made me.” “What else did God make?” “All things.” And so on), we gathered wildflowers in an ‘Easter’ basket and frolicked in the sunshine. This time in the woods was refreshing, as always. And much needed after the exciting week we had. All day yesterday I was out celebrating Earth Day with S. Smith on her last day in Houston, while kiddo was with her Grandmom dyeing Easter eggs (a tradition I can only get behind because I love eating hard boiled eggs). 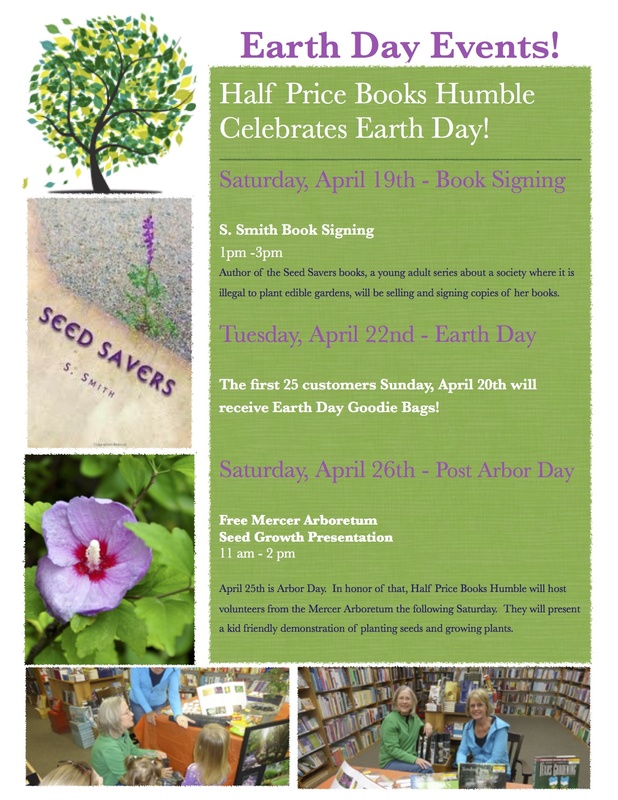 Below are pictures from the Earth Day Celebration Seed Savers Signings at HPB Humble and then HPB Montrose. There’s more celebrating to be had. S.Smith will be touring San Antonio, Austin, and Dallas before she heads back to Oregon; and HPB Humble will be giving away reusable bags to the first 25 customers Tuesday morning. Next Saturday (HPB Humble) there will also be a seed presentation by the Mercer Arboretum volunteers! 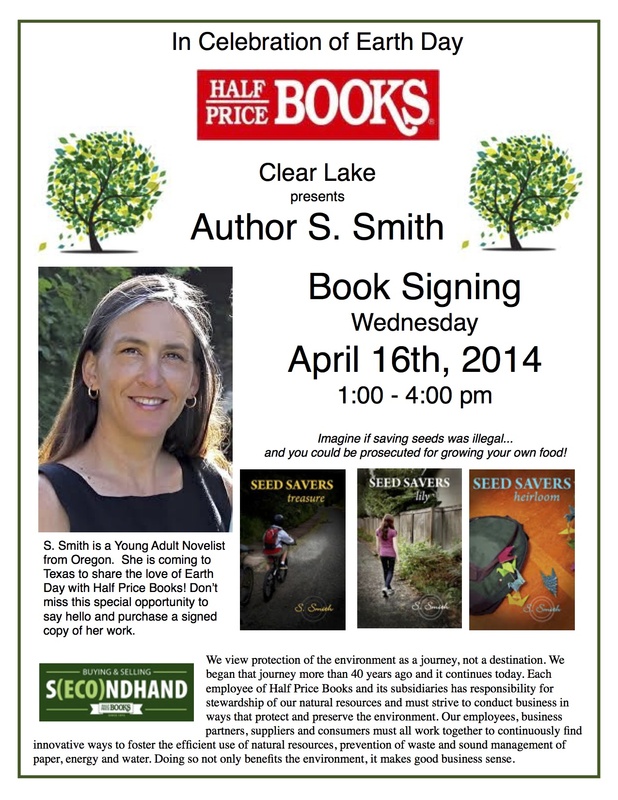 The Half Price Books Clear Lake store was a lovely host today for S. Smith’s first signing of her Texas Earth Day Tour. The weather was gorgeous, a little chilly for we Texans, but quite beautiful. A great day for an author from Oregon to set up shop in Houston. 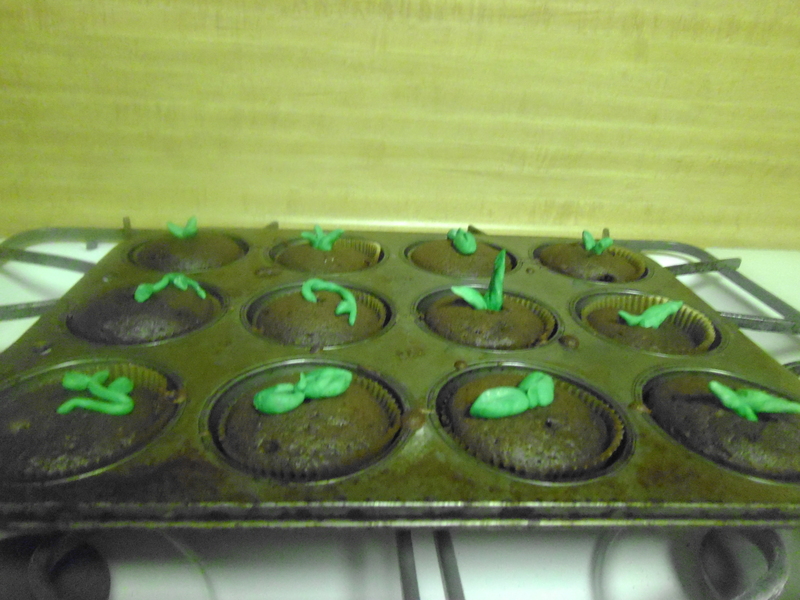 Last night, in preparation, I made seedling cupcakes. 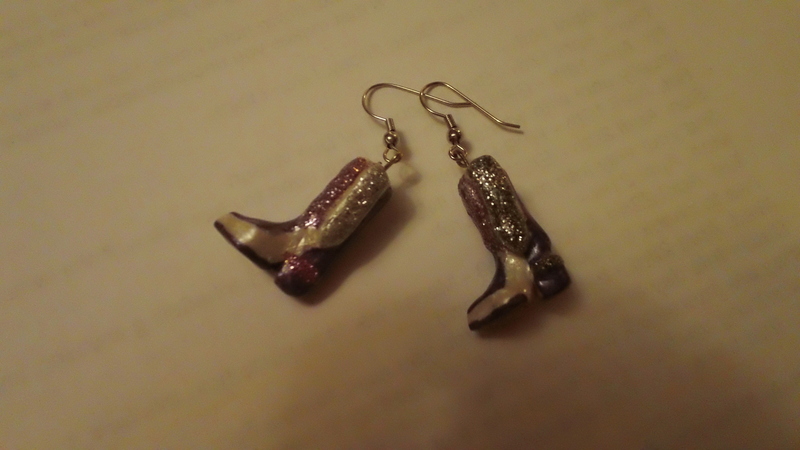 Yet another great Pinterest idea that the Texas humidity took a toll on. The fondant sort of got floppy the warmer it got throughout the day, and the green sort of melted a bit. But over all, I’m pleased with my first try. 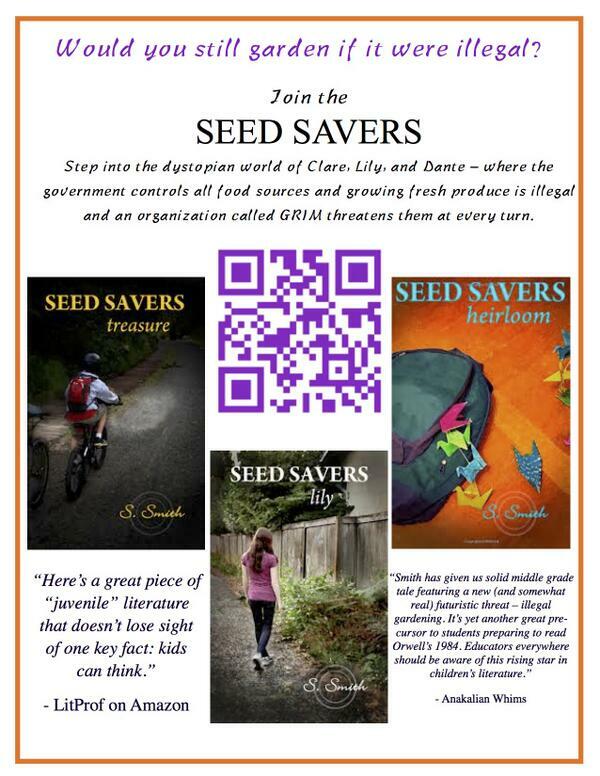 If you’re stumbling across my blog for the first time, Seed Savers is a young adult series about a dystopian society where growing your own fruits and vegetables is illegal. So naturally, an underground organization is created to keep the art and know how of gardening alive. It’s good garden sense mixed with the danger and adventure of kids on the run from the government entities hunting them down. There are three books in publication that Sandy is signing and selling right now, but the series is set to be five volumes long. The story is pretty epic, in my opinion, as you can tell if you read through all the past Seed Savers posts featured on this blog. I adore this woman and all her work, and I hope that everyone who purchased her book today feels the same way when they’re done reading. S. Smith will be at Good Books in the Woods Friday night and then at Half Price Books Humble 1-3 pm and HPB Montrose 6-9 pm on Saturday. If you missed today’s signing, please make time to see S. Smith at the other Houston stores before she flits off to Austin, San Antonio, and Dallas. The author is from Oregon so this very well might be a once in a lifetime opportunity! I couldn’t have had a more perfect day. It all started with an amar yllis bloom opening and an email. 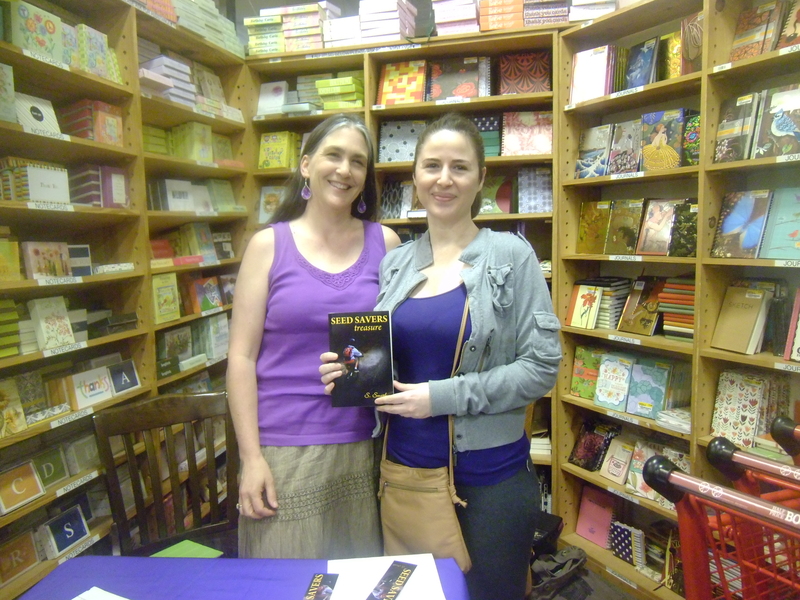 S. Smith had arrived in Houston and was looking to hang out before her first Half Price Books signing tomorrow. 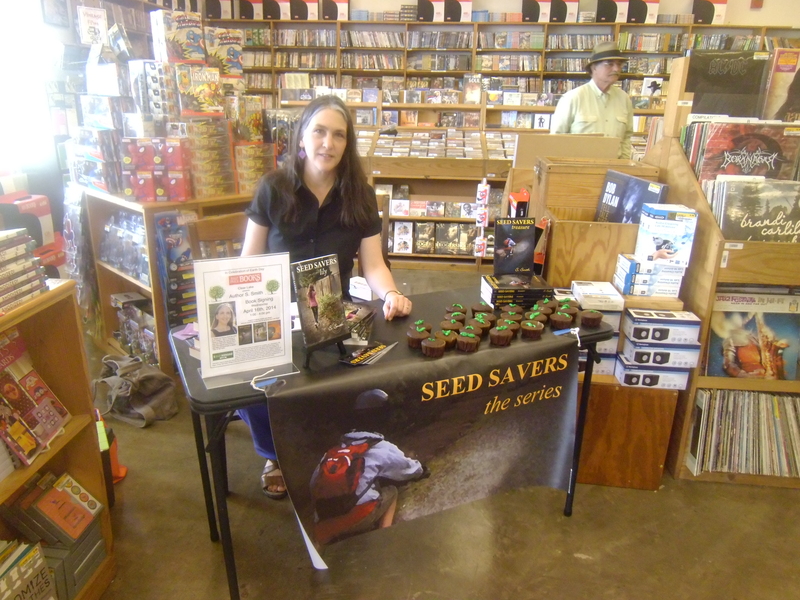 Today I finally had the pleasure of meeting S. Smith, the author of the Seed Savers series. I never thought this day would actually come, as I am a book reviewer in Texas and she is a young adult fiction writer from Oregon. But lo and behold! She had a reason to come down south and booked a Texas Earth Day tour starting with Houston. 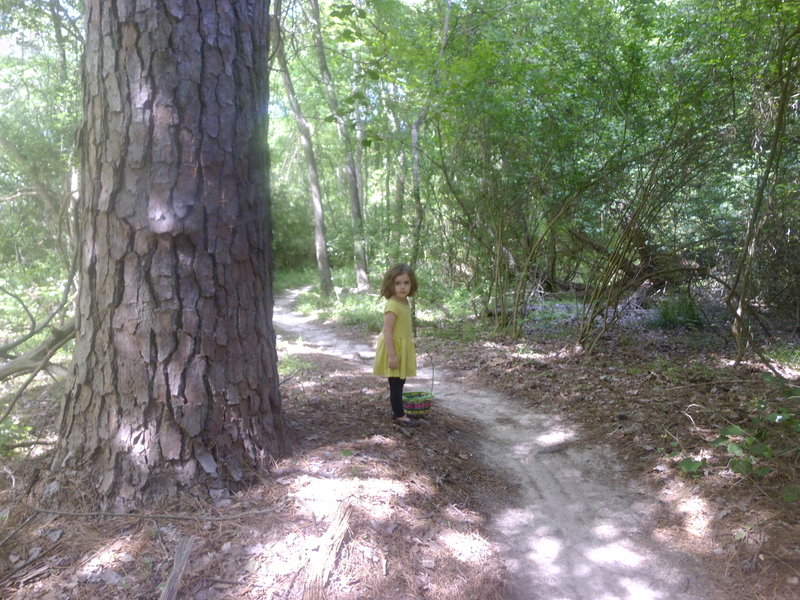 I was delighted that she wanted to go for a walk in the woods by our house. It was a joy picking along the trails, chatting, with my daughter and her husband in tow. We talked about the difference in the woods of Texas from where she lives in the Northwest. Below, kiddo, Sandy, and her husband stopped for a rest on a fallen log. 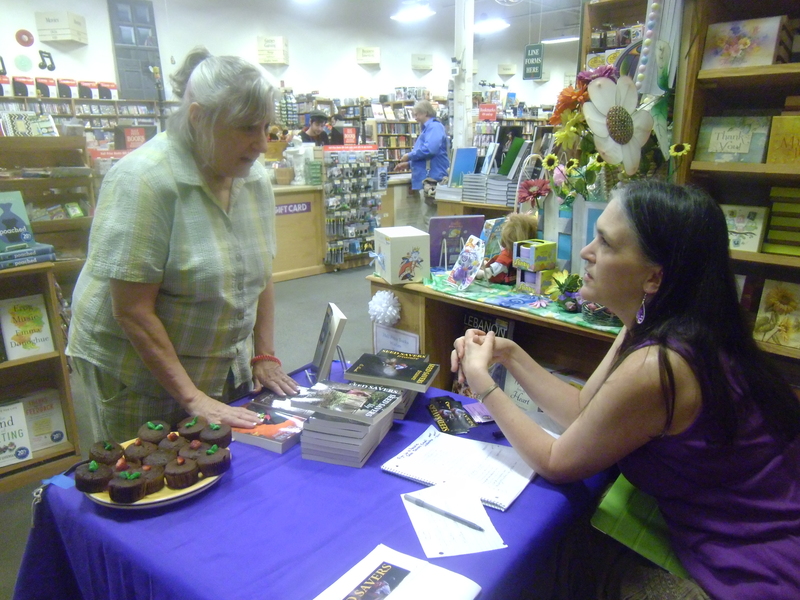 Sandy will be at the Half Price Books in Clear Lake tomorrow from 1-4 pm, Good Books in the Woods on Friday evening, Half Price Books Humble on Saturday from 1-3 pm, and the Montrose HPB store that evening from 6-9 pm. Her books are works of fiction for young adults about a dystopian society where growing your own fruits and vegetables is illegal, a fitting discussion topic for an Earth Day celebration. The month of April is full of Earth Day celebrations. More specifically, S. Smith, author of a dystopian young adult series that I can’t seem to rave enough about, has planned a trip to Texas from Oregon! I’m so excited! She will also be at the Montrose HPB (hpb.com/011) on Saturday, April 19th, 6pm-9pm. Just thinking about the act of doing nothing makes me cringe sometimes. I’m a doer. Albeit a relaxed doer, but a doer nonetheless. Then, I realized, it’s family season. I’m supposed to be hanging out. Thanksgiving just passed. It’s almost Christmas. Plus, sometimes the reading bug is in a coma because it’s still caught up in the last book you read. 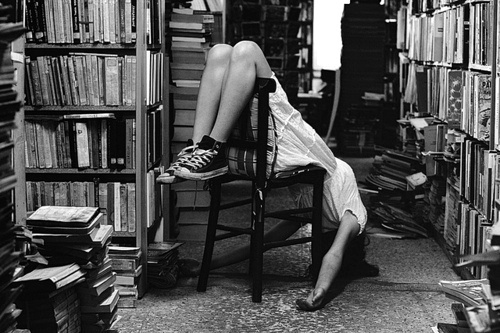 You know that one, “the book hangover.” You can’t move on to a new title with the same level of zest because your brain keeps lulling back to old characters. I felt that way pretty heavily after I finished reading The Hunger Games series in a two-to-three day stint. And now, I have half a mind to re-read the book that has induced this coma… Heirloom by S.Smith. It is not uncommon to find me looking something like this… and my house does look something like that. How appropriate that in this season of friends and family, Heirloom has such a gloriously familial title. Of course, another character responds, you’re his daughter so he loves you. Little girls just can’t hear that enough. 2014 cannot get here fast enough. 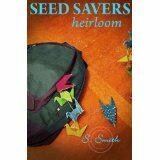 If you haven’t purchased your copy of Seed Savers: Heirloom , please do so by clicking the link with the title. The whole tour itinerary… so excited and honored to be first and last. 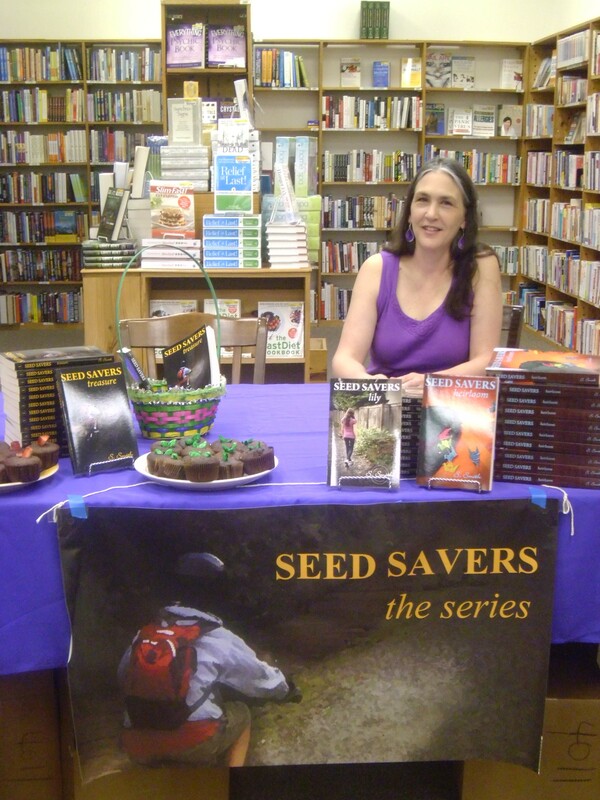 Here is the schedule for the Seed Savers: Heirloom blog tour and launch. I will update it as needed. “I haven’t been this in love with a young adult series since Harry Potter,” I wrote after reading the first installment of the Seed Savers Series – Treasure – for the first time. Having now read the second and third installments – Lily and Heirloom – I can happily say that the statement still holds true. No, there aren’t wizards or magic. The adventure doesn’t reach any of the same fantastical levels, but it is very epic. It is based in a truth that could easily lend itself to being our future. This dystopian society is so intense, because it’s so plausible. Treasure featured two runaway kids (Clare and Dante) after their discovery of the wonderful world of planting your own seeds and growing your own food, in a government where that is forbidden. They flee for their safety. They flee to learn more. Lily is where you get to know another character, Clare and Dante’s friend and fellow cohort in the Seed Saving excitement. In this book she blossoms before our eyes into less of a sidekick and more the hero. I was pleasantly surprised to find she had such a huge role in the story. She’s not just the key to almost everything, but the narrator as well! Who knew? After a long alienation from Clare and Dante, Smith is wise enough to bring us back and feed our curiosity. Heirloom is told back and forth between what’s happening with Clare and Dante, and the world according to Lily. I loved this pattern for a third in a series. It wrapped up some lo0se ends, it led us into asking more questions, and we were able to adventure cross country and learn more about growing plants in a cozy environment in the same book. My brain needed this. Heirloom, even more than the other two in the series, is full of interesting facts about how a society would get from where it was in the 1980’s to what it is in Smith’s novels. In a time when we are debating GMOs, organics, seeds, and patents, this book is a must have to help middle grade students grasp all the political nuances decisions of today will have on tomorrow. I love that Smith was able to take an intense political topic and weave it into a fascinating (and fun) story. If you’ve read books one and two, you cannot miss this third part of the series! It’s essential. It has propelled us so much deeper into the story and I’m jittery waiting on the fourth! It didn’t maintain the same read in one sitting quality of books one and two, but I believe that’s because the characters demand more of your time. There is so much more going on, and in the midst of it all they want to teach you as well. That takes more than a day. Clare, Dante, and Lily are growing and stretching their legs, and with them Smith is becoming more detailed and dynamic in her tale. Like good food, Heirloom was made to be savored. If you haven’t read any of the series, you must. 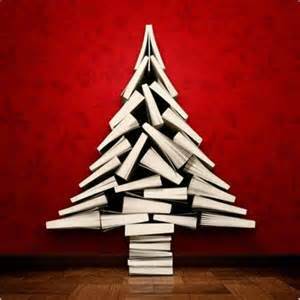 Purchase it for yourself, purchase it for your children for Christmas and read them together – or just swipe the copies and read them yourself. They are so good.